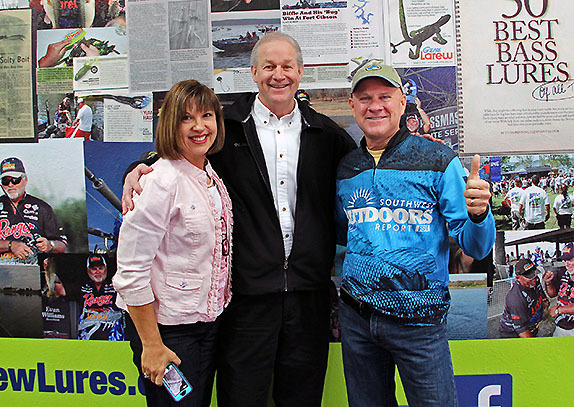 Gary Dollahon (center) poses with freelance journalist Rebecca McCormick and outdoor TV host Barry Stokes at his Tulsa, Okla. office. Not much in the modern bass fishing industry traces its roots back to the state of New Mexico. Gary Dollahon is an exception. Dollahon, the owner of a Tulsa, Okla.-based public relations agency that bears his name, has been immersed in the angling business for nearly four decades. In recent years he's helped to resurrect a couple of brands � Lew's and Gene Larew � that were once prominent, but had mostly drifted out of the consciousness of 21st-century fishing enthusiasts. Now just one year from the traditional retirement age of 65, he has no plans to give it all up and just go fishing for his own entertainment. "I thoroughly enjoy what I do and being around the people I work with," he said. "As long as I have the ability and desire, it's my intention to keep doing it. "Working with some well-known brands that had faded and being involved in their re-launch and watching the growth and success they've had has been very rewarding. I love interacting with the professionals at the companies we represent and helping them strategically mold their direction. What I enjoy most is thinking ahead � finding out where they want to get to and then helping them achieve those types of goals." Dollahon hails from Roswell, N.M. � a place that's much more well-known among extra-terrestrial conspiracy theorists than angling aficionados (Google up "Roswell UFO" if you're interested in that topic). He obtained a degree in wildlife science from New Mexico State University and was hired by the state game and fish department, where he got his first taste of the PR game. The original Dollahon Public Relations team included the founder's daughter Crystal. He married the daughter of his boss (the chief of the public affairs division) shortly thereafter, and then about 5 years down the road he got acquainted with a dermatologist and avid fisherman who became a pioneer in SPF 15 sunscreen. The doctor had formulated a version for anglers that was waterproof and one application lasted all day, and he hired Dollahon to help him promote it (the name of the product was Overcast 15). "That was my first jump into the industry on a national level," Dollahon said. "I handled all the marketing and selling of it � buying the advertising, dealing with the media and sponsoring pros." In 1988, he moved on to Mann's Bait Company in Eufaula, Ala., where he stayed for 5 years. That was followed by a decade-long stint with Zebco, which landed him in Tulsa. He launched his own agency in 2006. One of DPR's three employees (in addition to the boss) is FLW Tour pro Andrew Upshaw, who takes on many of the tasks involved with the Lew's, Larew and Bobby Garland Crappie Baits accounts. There's also Brandon Tuttle, a web developer who came over from Cabela's, and marketing coordinator Robyn McKerley. "We're small by design � everybody's involved with everything we do," Dollahon said. "Everybody knows what's going on all the time." On top of the extensive work with Lew's, Gene Larew and Bobby Garland, DPR takes care of corporate communications for Major League Fishing and does project work for companies such as Rat-L-Trap, Jewel and Tracker Boats. It has one client in the natural gas sector that now employs Dollahon's daughter Crystal, who was originally part of the DPR team. Dollahon feels that his experience in several facets of the fishing industry gives him somewhat of a unique perspective that allows his firm to do more than just promotional work for its clients. 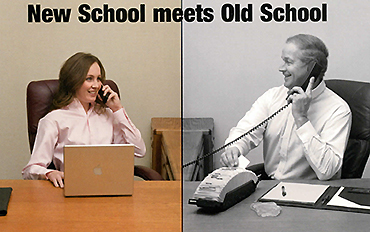 "We started out doing just PR, but we've evolved into a full-service marketing agency," he said. "With Lew's and Larew, we do full website development and administration, ad creation, ad placement and ad buying as well as marketing communications. Working with the press is something I've always enjoyed, and still do to this day. "The people I'm around are fun people to work with � true pros with a high level of passion. When everybody enjoys what they're doing, then it's easier to get on the same page to achieve success." > Dollahon and wife Donna celebrated their 40th anniversary in August. In addition to daughter Crystal, they have a son, B.J., and three grandchildren ages 2-5. > He provides the Oklahoma fishing report, called "Sooner Beat", for a program on a regional Fox Sports network that airs 39 weeks per year. > His latest project is operating Crappie University, the classroom program taught at colleges and universities around the country. Gary White, founder of the Bass Fishing Technique Institutes, started the program 2 years ago and Dollahon has been involved with it from the inception.